Lisa and I attended a very fun cooking class with Top Chef Season 4 Cheftestant, Nikki Cascone at her Soho restaurant, 24 Prince. The class involved Nikki demo-ing dishes for us, and we got to pick her brain about recipes, culinary techniques, and of course, Top Chef gossip. Originally, the class was supposed to take place outside in 24 Prince's back garden, but due to unpredictable weather, they moved things inside the restaurant. We didn't mind at all, as we got a primo spot, right in front of Nikki - surveying her techniques and listening to her lively commentary. Our fellow class attendees were mostly 20 or 30 something women who through a show of hands, were pretty much all Top Chef junkies like us. Needless to say, everyone seemed enthusiastic and interested in what went on. 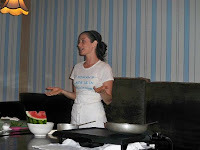 Nikki presented us with a summer menu: watermelon salad, jumbo shrimp with sweet corn and homemade pineapple sorbet and macaroons. Overall, the food was light, fresh and very flavorful. I didn't feel overstuffed but was comfortably full and not guilty about what I ate. It was awesome. 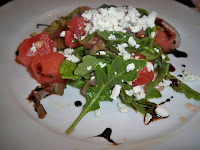 Watermelon Salad - This was mine and Lisa's favorite, as it was the perfect summer dish. All ingredients were seasonal and therefore super fresh and flavorful. The best part was the sprinkle of tangy ricotta salata cheese on top as well as the earthy pine nuts. Both ingredients gave the salad substance and made it feel like a hearty dish instead of a small snack. I would definitely make this at home and plan to do so soon. 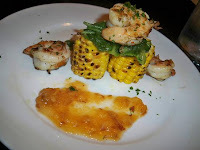 Jumbo Shrimp with Sweet Corn - Another inventive spin on a simple dish, it was spiced up with homemade peach chutney. When I saw how beautiful and ripe the peaches were, I almost didn't want Nikki to cook them, but the result was excellent--sweet, chunky and a nice complement to the shrimp and corn. I liked that Nikki gave us a good tip for cooking corn--placing it in an aluminum foil packet, adding a bit of water and butter, and then sealing it and putting it in the oven for a couple of minutes. The shrimp was cooked perfectly, overall making this a light, healthy dish that left you feeling vibrant. 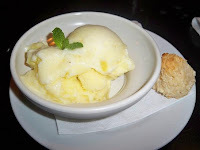 Pineapple Sorbet with a Homemade Macaroon - Nikki didn't show us how to make sorbet, she just told us that she uses an inexpensive ice-cream machine that she bought at Crate and Barrel. While the flavor was strong, there was a weird aftertaste that I didn't like (sorry Nikki but I've had better). The macaroon on the other hand was superbly moist and incredibly indulgent--it was bite sized, which was good for the conscience (and the thighs) because I could've eaten an infinite amount. Simply put, Nikki made the show! She was friendly, charismatic and totally up for answering any questions from the audience. She was down to earth and approachable, joking around with us and even providing us with Top Chef gossip (i.e. Padma is a bit of a snob, Tom Colicchio is a doll, she's actually only half Italian--the other half is Jewish). What's next for Nikki? Well for starters, she's getting married in June 2010, she's writing a cookbook and opening up a pasta bar. Busy lady! If you're thinking about taking a class, they're continuing them on every 2nd Wednesday of the month. They've added a class next Wednesday, August 19th and the one after that is on September 16th. Menus are seasonal, so expect something different in September. Cost per class is $35 + gratuity so it comes to $42. If you're interested in the recipes from this class, email me at critic@foodistanyc.com and if you'd like to attend a future class, email Emily at emily@24prince.com or call 212.226.8624, and tell them I recommended you. Enjoy! I LOVE Top Chef, Nikki was a favorite in that she was talented and seemed like we could be buddies, I just made watemelon salad (feta, but I like ricotta salata more; that's why she was on TC, not me), I love making shrimp salads with summer fruit, you now know her, and I know you, so now we're all buds and should hang out, all friendly-like. Padma's more snobby than Tom?! That is a scoop. I'd have thought the opposite. Who do you think will win Top Chef Masters, and wasn't it a surprise that Michael was so... um... bitchy last night? Michael is a pill, omg. I know who will win - Grub Street spilled the beans months ago :( Rick Bayless! I love him! As a big fan of Top Chef I was very excited when I heard about this event! Something different than the usual summer restaurant week! Was fun and the salad was definetely the best and something that I will experiment with making at home. The shrimp was also very tasty. Dessert was just okay the macaroon was the highlight! The restaurant was so cute and some place that I will definetely go back! Too bad the weather didn't hold out I would have loved to sit in the back patio! Nikki was very sweet and seemed very passionate about cooking! I'm excited to try her new restaurant ventures in NYC! The only thing missing from this event was a complimentry alcoholic drink or soda! Otherwise was well worth it!